male "Tanzanian" Sand Boa attempting to mate with female. Images of captive color morphs are included further down this page. 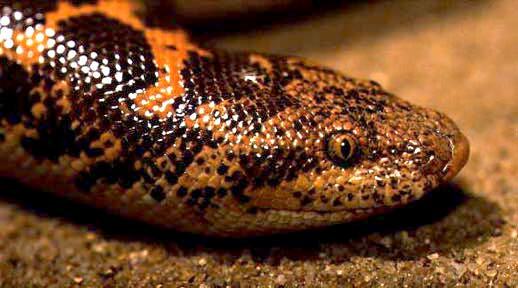 The East African Sand Boa is the Sand Boa that is most commonly kept in the United States. This species is found in Tanzania, Kenya, much of Ethiopia, Sudan, northern Somalia, northern Chad, western Niger, Egypt, and western Lybia. It has also been reported from the Arabian Peninsula in Yemen. (I recently received a correspondence from Stephen Spawls, in Ethiopia, who informed me that in Ethiopia, "the sand boas are only found in the low altitude areas, i.e the extreme north-east, the east and south-east (and along the Kenya border)"). (I will in the future correct my map, but for now want to at least acknowledge the error of my current map). This species has traditionally been treated as two subspecies, the Egyptian (E. c. colubrinus) and the Kenyan (E. c. loveridgei). These two subspecies were differentiated on the amount of brown/black spotting on the sides of the snake, but in the pet trade, the distinguishing characteristic was inferred to be the background color (orange in Kenyans, yellow in Egyptians). However, the taxonomic distinction between the "Egyptian" and "Kenyan" Sand Boas is unwarranted. 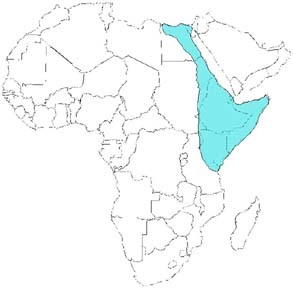 Tokar (1996) examined the patterns of geographic variation seen in this species across its range and concluded that there were no consistent differences that could be used to distinguish the subspecies colubrinus and loveridgei. The pet trade has further complicated this issue. Many "Egyptian" Sand Boas (i.e. 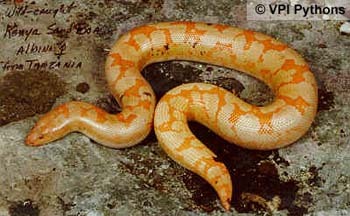 light yellow/orange animals from northeastern Africa) are sold in the U.S. as "Kenyan" Sand Boas. Sometimes this has been based on not recognizing any taxonomic distinction between the two, but more frequently the herpetocultural taxonomy is driven by greed (the darker orange "Kenyans" typically command a higher price than "Egyptians"). This is unfortunate as the "Egyptian" Sand Boa is a beautiful snake in its own right. It is typically paler than the average "Kenyan", with brown spotting on a yellowish ground color. Tokar also discusses a third "phase" of this taxon (the "rufescens" phase). This phase is currently not available in captive snakes. "Rufescens" phase snakes are uniformly brown-backed snakes with light (orange/yellow) sides. Steve Spawls sent me this photo of a young "rufescens" sand boa from north eastern Ethiopia. Although this individual is fairly rufous on the back (thus "rufescens"), Steve informed me that specimens from further south, down towards Kenya, are considerably darker. In fact, they are dark enough that Somali snake collectors refused to collect them as they confused them with the venomous Stiletto Snakes (aka Burrowing Vipers) of the genus Atractaspis. This is the only photo I have ever seen of this morph, and I am very grateful to Steve for allowing me to use this interesting image. It is interesting that this dark-backed color pattern is also found in the Arabian Sand Boa, the Rough-scaled Sand Boa (described as "E. whitakeri") and the Desert Sand Boa (often called "E. nogaiorum") (see the discussion under the latter two species accounts for more on those phases). This species is now bred in large numbers in captivity. There is a widely bred amelanistic (albino) mutant available as well. 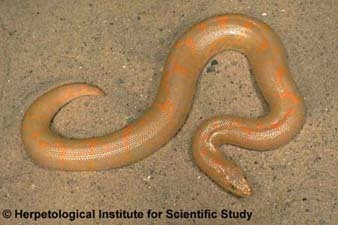 The original albino (amelanistic) "Kenyan" Sand Boas were all bred from an albino "Egyptian" Sand Boa and most amelanistic colubrinus in the herp trade today are derived from this "cross". The snake below on the right shows an example of this color phase. The snake on the right was produced and photographed by The Herpetological Institute for Scientific Study (now back in business!). (The photograph is used with their permission). There have subsequently been amelanistic sand boas exported from Tanzania. The snake in the photograph on the above left is a wild-caught amelanistic Sand Boa from Tanzania currently owned by Dave and Tracy Barker of VPI Pythons. (This photograph is used with their permission). This snake shows a few spots of black pigment that are not normally found on albino snakes. This has led to this "morph" being named the "Paradox albino". 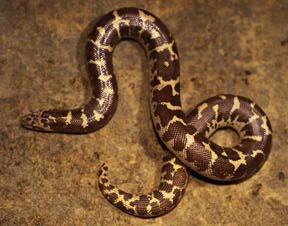 See the VPI page for more pics of these unusual sand boas. There is also an anerythristic (axanthic) mutant available in the pet trade. These snakes lack the orange/yellow pigments and are basically a white snake with black spots. The above snake was produced by Dave and Tracy Barker of VPI Pythons and is used with their permission. 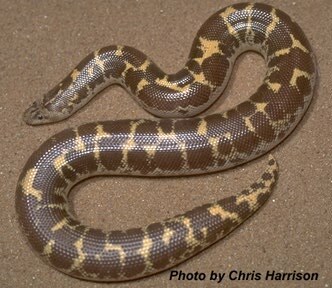 The VPI web site has a good gallery of some of the other morphs of East African Sand Boas in captivity. 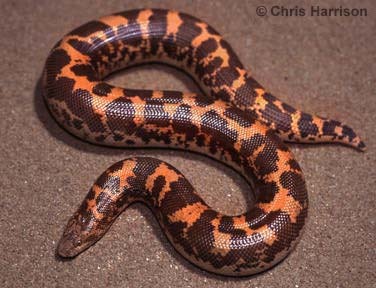 Amelanistic sand boas have been crossed with anerythristic sand boas to produce a "Snow" Sand Boa (kind of an oxymoron in my view). 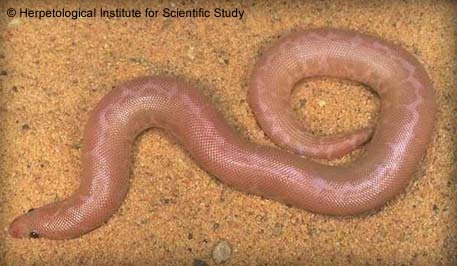 The above Snow Sand Boa was produced by The Herpetological Institute for Scientific Study. East African Sand Boas are very hardy captives. Wild caught snakes may carry a significant parasite load and should be evaluated by a qualified veterinarian. Captive born babies are available in large numbers every year and are relatively inexpensive. 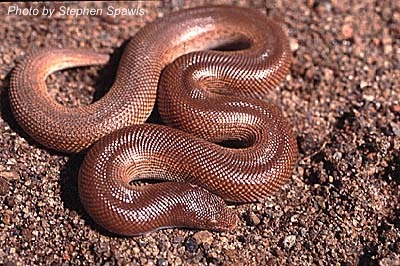 Although this is the most commonly bred species, it is not always the most docile sand boa. Some specimens can be downright snappy and take a period of gentle handling before they stop biting. Almost all colubrinus will take appropriately sized mice in captivity although a few specimens, particularly small ones, may prefer lizards at first. 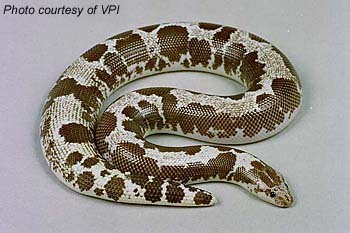 East African Sand Boas generally breed in June or July and produce 6-20 young in October or November. The young snakes look like paler versions of the adults and will usually take pink mice after their first shed. As they grow their color intensifies. See the general care page for more information. Sorenson, David. 1988. Behavior and Reproduction in the Genus Eryx. Proceedings of the 10th and 11th International Herpetological Symposia. Tokar, A.A. 1996. Taxonomic revision of the genus Gongylophis Wagler 1830: G. colubrinus (L. 1758) (Serpentes Boidae). Tropical Zoology 9: 1-17.